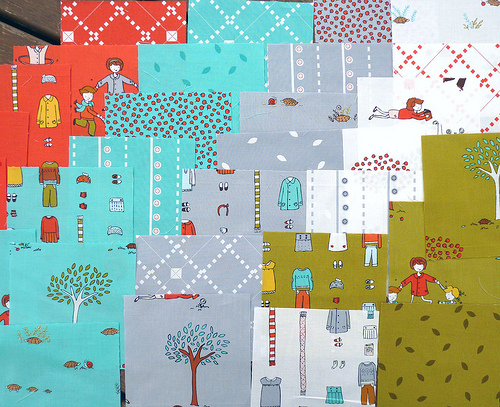 This collection is Little Apples by Aneela Hoey for Moda and is due for release in the Fall (or Spring depending on where you are). 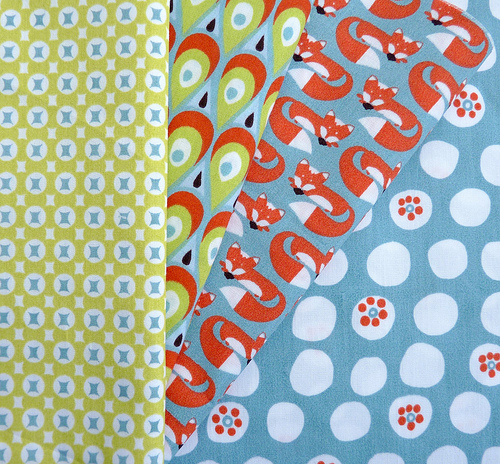 This is Aneela's second fabric range (preceded by Sherbet Pips) and looks like it will another fun collection to work with. Loving your work Aneela! Wow! I just love the Little apples. The colours and the prints! The white, grey and aqua look so fresh. I can't believe you scored some Little Apples! I'm completely green!! Please hurry and do something with it, so you can post and show all of us (regular people - ha!) who are eagerly awaiting its release. Just go ahead and tell me...is it as fabulous in person as it looks online?? That fox fabric is really sweet too. My Dad lives in a heavily wooded area with lots of wild foxes. My kids go wild watching them out the window when we go to visit him. They are very playful critters! I may need to work that fabric into a project for them just for the sake of our fox memories. You always seem to find the best fabric! Little Apples looks like such a fun range. That fox fabric is really cute!!! I am in love with those Monaluna foxes and peacock feathers! I have to get some when they're available!